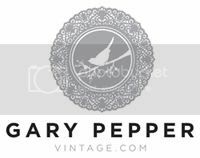 Gary Pepper Vintage: G O L D E N G A T E .
G O L D E N G A T E .
Usually I'm doing two things when I'm driving - day dreaming and clearing my head whilst keeping an eye out for pretty locations. I'd like to think it's kind of a skill to be not paying attention but paying attention at the same time, if that makes sense? Loved finding this gate with leaves scattered around the front so Luke quickly took some photos of my outfit before I went out on Friday night, where unfortunately I was reminded that even though you're young there are always going to be people younger than you who more than likely have a fake ID and are giving you attitude at the bar. It was indeed one of those "I feel like the oldest person here" nights but it was definitely a good thing. It makes it so much easier to justify spending my weekend indoors with the heater on, a pot of English breakfast and the never ending list of things I need to get done for the store. I think it's going to be a productive Winter. On another note I found this pleated maxi skirt for only $39 in a little store in Bondi Junction called "Tattoo" which is one of those random cheap stores that have some amazing buys from time to time. To anyone who has ever asked where my vintage black pleated maxi skirt is from I'd suggest going to this store and picking one up, as this skirt also comes in black and they're pretty much identical. I don't think you could even make this skirt for a mere $39 these days? Crazy. It's always interesting to see trends repeat themselves a decade or so later and finding yourself squatting, playing with leaves and taking photos for something they call a "blog". Teenagers these days..
Lovely pics! Love your skirt! Great colour! Im wearing the black one right now. So comfy. Wow! I would have never have guessed that that skirt cost only $39? We should open up a 'nightclub' for those who drink tea and like to stay warm. I think it could go quite well! This all looks beautiful! Pretty sure I've seen that same branded skirt in a mustard-y colour too. It's such an ideal design. The colour of that skirt is amazing! Lucky you!! I adore the pleats and the fur bag! I love the pleats on your skirt. Great colour as well. So rich. What a beautiful combination! Those leaves and your lovely outfit are just stunning together! You look beautiful, Nicole! That's soooo sweet! Loved your outfit, the skirt is marvelous! I bought that skirt too! It's such a divine wine colour. This is by far one of my favorite outfits of yours. The cropped jacket with the fur clutch is so ladylike! Looking gorgeous, hun! your outfit is simply perfect! im in love with that skirt!!! I am in love with that skirt, but since it's vintage and you probably would never ever find it in Ireland, never mind Europe I'm gonna have to do without. Beautiful shots as always and I love how ethereal the light always looks in your pictures. LOVELY OUTFIT <3 You're so gorgeous! Perfect outfit. I wish I was wearing that right now! The colour of the skirt is stunning, and I love the dark red with the pale blouse. Have to agree with the comment above. You look gorgeous as always! Love that skirt. 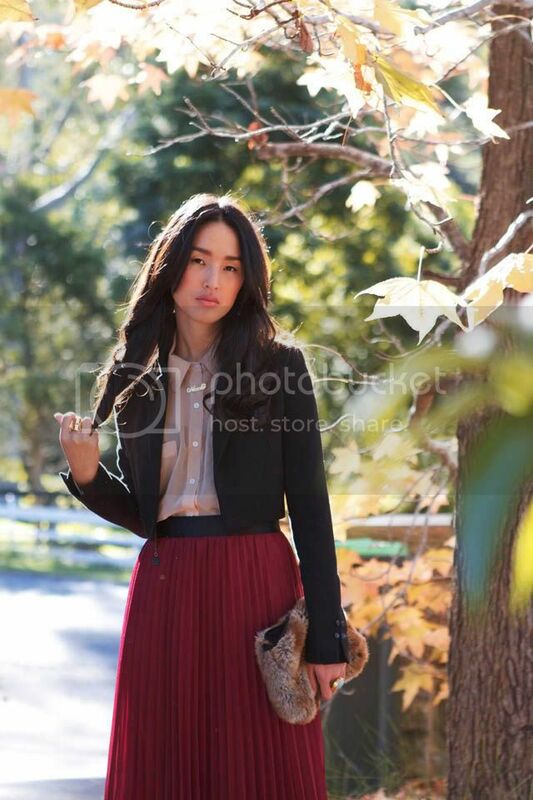 This outfit looks so elegant :) The cropped blazer looks super good paired with the pleated skirt. That hint of sheer adds a nice feminine touch too. Lovely! stunning look dear! I love it so much! such an amazing outfit, and you are oh so beautiful! That wine colored skirt is beautiful. You always look perfect, but this outfit is more than LOVE! It's so chic. omg, i fall in love with your clothes! :D i'm jealous. Ah…. You look so beautiful. I love the dusty pink color of that blouse. Love that look! 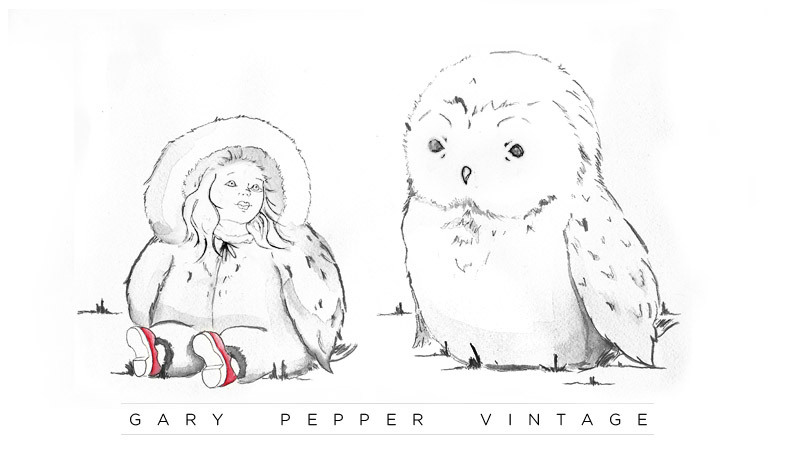 Vintage, classy and chic! That skirt is amazing, and the colour is so rich! AMAZING skirt, love the way you paired it! The colors look AAAMAZING!!! My friend and I have seen a fair few of these skirts around. But this one seems different. Maybe because you're wearing it? Ha, I dunno but I like that it's fully lined because it is rather hard to find them like that. I don't get why stores make maxi skirts that have a mini shift under it. To me it seems kinda pointless. You look perfect! Are those heels hard to walk in?? im a sucker for red and i totally love this! Oh wow, that outfit is absolutely stunning! You look gorgeous as per usual. I love the colour and the pleats to that skirt! I would die for this skirt!! I like your style!!! You look so nice always :) This your skirt are amazing. that is an amazing colour. Wish I could make it to 'Tattoo', LOVE that skirt! 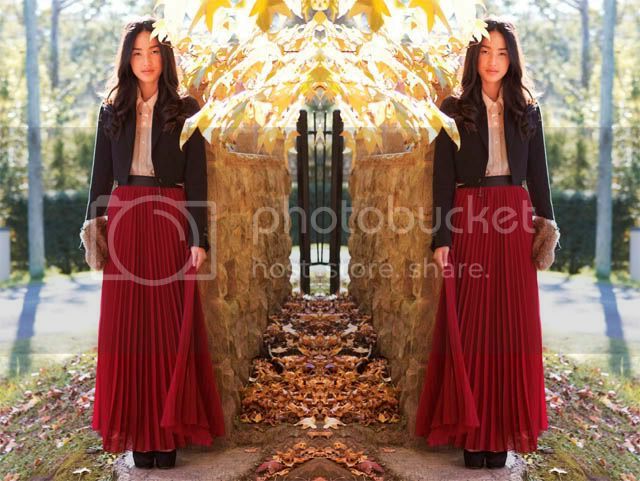 Love the pleated maxi skirt <3! LOVE the outfit, the skirt is a gorgeous colour! Love ur blog and style!! 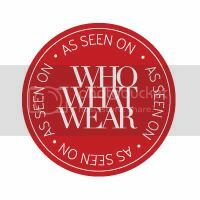 U are one of the best Bloggers that inspired me to make my own blog to! I own also boutiques and take mostyl pics of my new items..love to have u in my blog! umm, yes, can i put you in my pocket and take you with me everywhere i go? Gorggg! I zone it when I drive sometimes too! Good to know I'm not the only one that does it. lol. Love the skirt on you. The color is perfection! Come visit some time at http://stylelustpages.com! Oh, I just absolutely adore this outfit! I want that skirt. You look so amazingly beautiful! That skirt is amazing. The whole outfit, actually, is lovely. Loooooove the skirt! Your outfit is great!!!!!! As has been said many times - It's definitely a beautiful outfit! I just love this look. Something old, something new, the silhouette is beautiful and poetic, the colors in perfect harmony. In love with your skirt Nicole!! What a great find! This outfit looks amazing, seriously well put together! I looked up your blog after seeing it in the Style Diaries book, brilliant content!